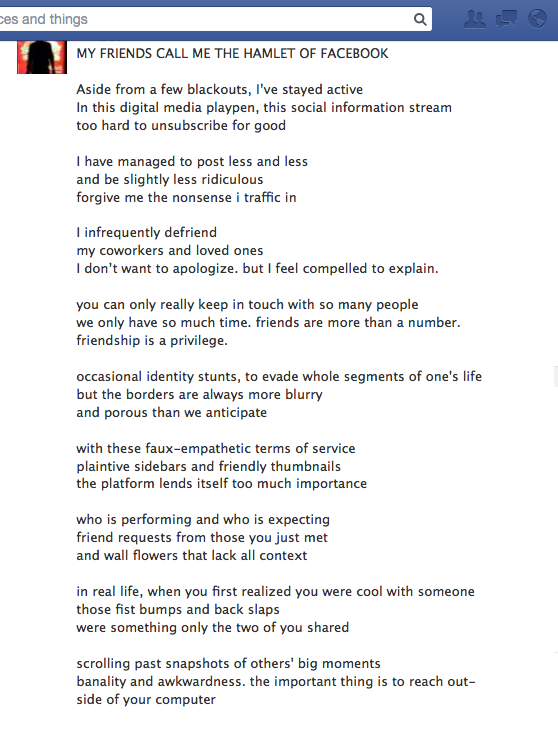 Rather than post one of those confessional essays about why I’m quitting Facebook (which would probably only last a short while), I chopped up my notes and turned them into the poem above. I don’t have any grand points to make about society or modern communication, but I wanted to somehow give voice to the general social media anxiety I’ve been feeling lately. My sentiments exactly, although my thoughts regarding “the general social media anxiety I’ve been feeling lately” are still jumbled in my head. Your words are eloquent. Well said, Luke.